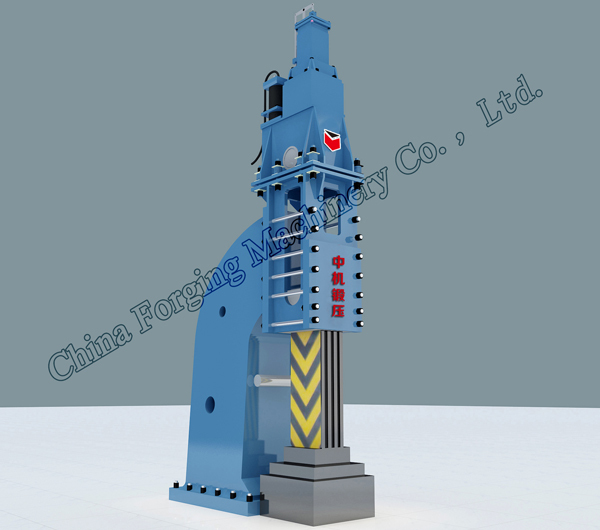 Follow-up control fully hydraulic open die forging hammer is a kind of electric-hydraulic hammer operated by follow-up valve and drove by fully hydraulic driving system. The lower chamber of its cylinder is connected to high pressure oil always, and follow-up valve controls the upper chamber oil in and out to realize striking and return. When upper chamber connecting to high pressure oil, it will drive cylinder to get pressure difference and with ram gravity to realize quick striking; when oil discharging from upper chamber, oil will act on circle area of lower chamber and conquer ram gravity and relevant friction force to realize return. 5) Hydraulic system pressure is stable, so it is easy to realize striking energy precise control. Such hammer is a kind hammer that can instead of hydra-pneumatic hammer with its advantages, such as simple structure and lower malfunction. 6) using feedback explosion-proof hydraulic valve(patent) and special high pressure tube protecting structure to prevent high pressure oil leakage in special condition. 5) Designing ram dovetails protruding to improve its life. 7) System is designed with over pressure and losing pressure protection. When main oil tube or piston rod is broken, system will close main oil channel and turn off the main motor at once to improve system safety. This kind of hammer can realize many progress same as single bar discharging oil hydra-pneumatic hammer, and especially applied on hydraulic control and driving of open die forging hammer. It also can be used on die forging hammer.